The historic harbour town of Kyrenia, Northern Cyprus is a beautiful holiday destination in the Mediterranean. Nestling into the Kyrenia mountains, this is one of the most charming and intimate harbour towns to be found anywhere in the Mediterranean. Relaxing by the waterside, drink in hand, and gazing into the harbour watching the yachts come and go, watching the people strolling around is a classic way to chill out here in Kyrenia. There is plenty of strolling to enjoy looking a shops, checking out the chic dresses or checking out the tailors offering made-to-measure clothes ready in days to take home. The rambling, narrow streets of the old quarters too are interesting to roam, especially when you chance upon a hidden courtyard café or restaurant. It is in the cobbled back streets where history is more keenly felt. Archaeological evidence indicates Kyrenia has been a settlement since the Neolithic period but certainly inhabited by the 10th century BC. An ancient shipwreck found just outside the harbour, now in the museum, suggests a lively maritime trade by the 3rd century BC. It rose to become a powerful administration region but its fortunes fluctuated over the centuries The Romans built the first castle to protect the harbour, the Lusignons certainly left their footprint but it was the Venetians from 1489 who set about to substantially rebuild it to the powerful fort seen today. It remains unscathed by war since the town surrendered without a fight when the Ottoman army arrived on its doorstep in 1570. Built to protect shipping, the castle overlooks the harbour from the eastern side. It was once moated and this is crossed by a bridge as you enter. Inside the visitor is greeted with architecture from its periods of occupation. The powerful walls are Venetian, the chapel of St George is a Templar church and much else on view is from the Lusignon occupation. There is nothing now relating to the first Roman structure. Inside one of the Gothic halls is the shipwreck museum displaying the carefully preserved remains of a cargo boat from around 288 BC. It was discovered by a sponge fisherman in 1965 at a depth of around 30m and salvaged between 1967-1969. The ship is believed to have arrived via Samos, Kos and Rhodes and was carrying 400 amphorae of wine amongst other products. 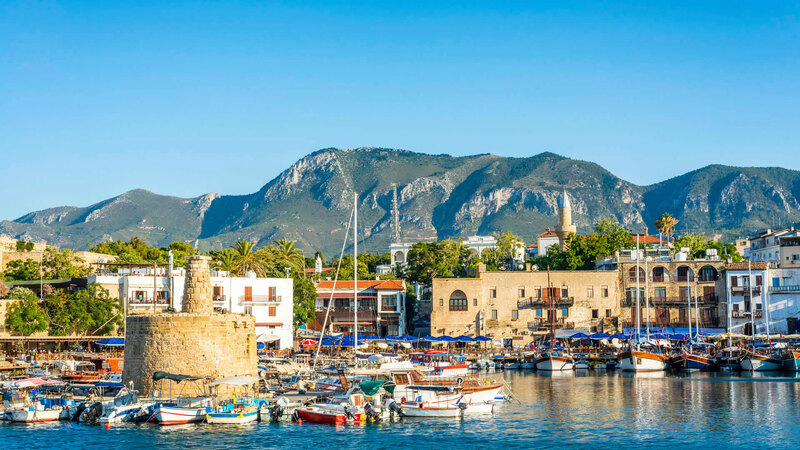 Explore this historic corner of Mediterranean with a car hire in Kyrenia, North cyprus.